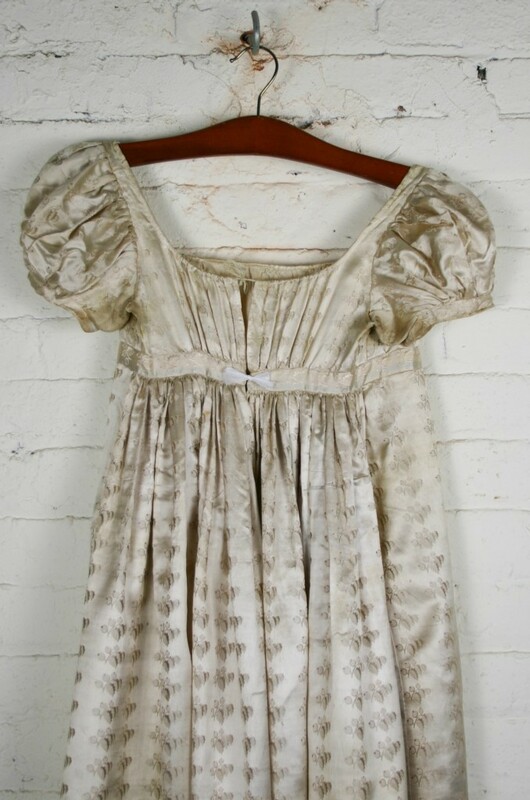 Very rare antique French Neoclassical dress from between 1805-1820. 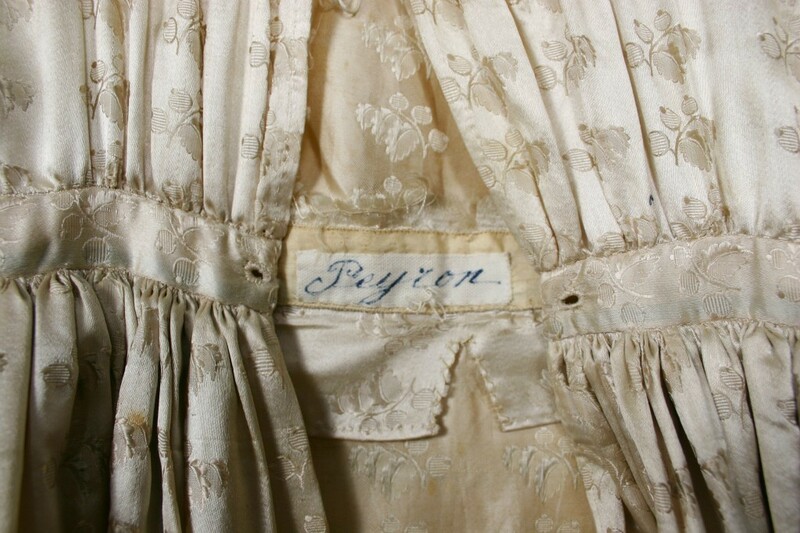 Handwritten label inside reads "Peyron". 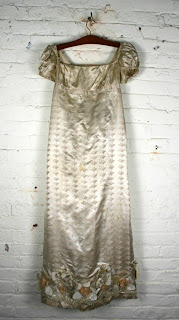 I purchased this from a lot of antique clothing from Paris. 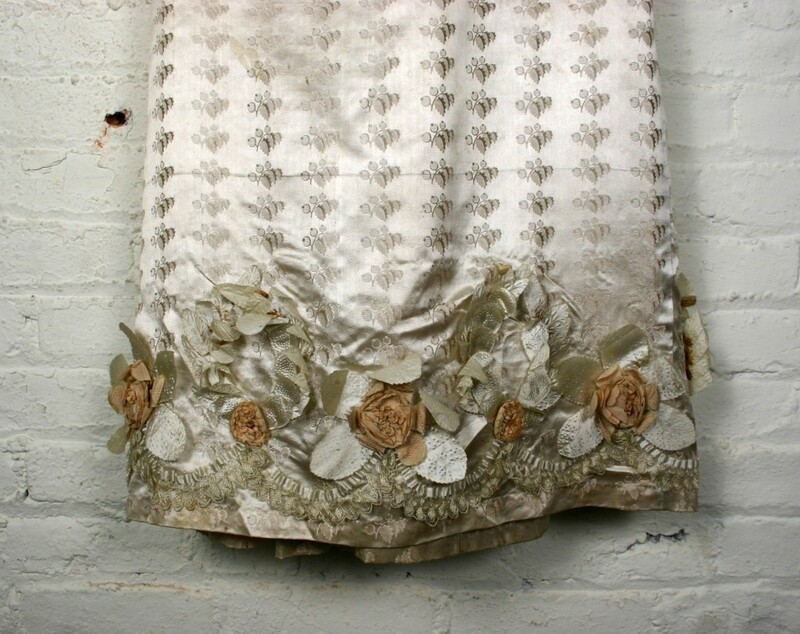 Ornate trim across the bottom with pink flowers, champagne leaves and fine lace detail. Classic empire waist bodice has a drawstring at the top and holes for another drawstring under the bust. 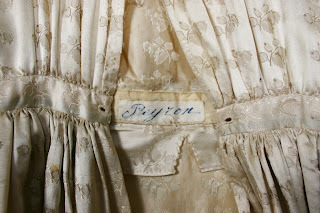 I used a white ribbon to show the fit, but the original is missing. The skirt is very full in the front with lots of pleats and gathers right under the bust. Very tiny size - I would say a 2XS or XS. 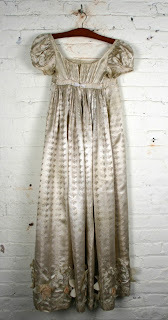 There are several issues with this dress - many can be easily repaired, but I figured I'd leave this up to the buyer. 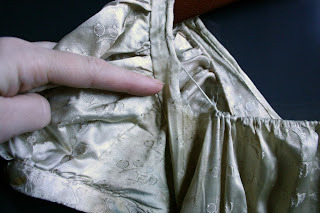 The drawstring is a little shredded at the ends and as you can see in the pics, it has torn through the back corners of the dress. The material is still there, so this is repairable. Besides this, there are NO tears, holes or shredding in the material! 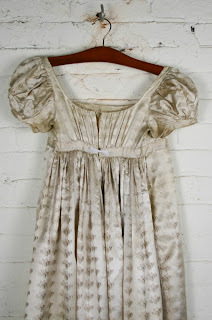 There is some allover stains - the worst ones are in the back, see pic. I have not tried to remove any of them and did not iron over them, so they may be removable. Some discoloration under the arms. 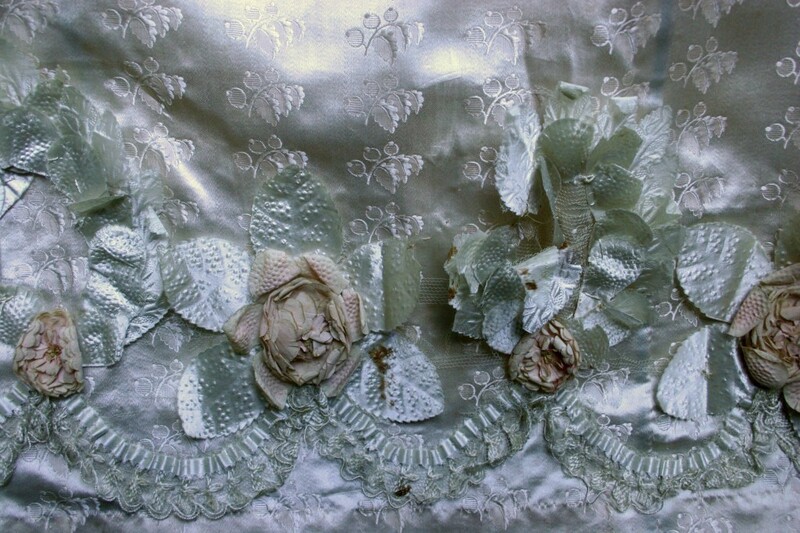 The trim is in pretty good condition, but there are some breaks in the lace and one section has a couple stains, I believe from a glue that someone used long ago to try and re-affix some leaves. 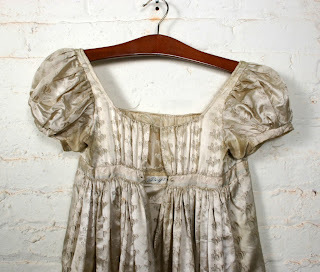 Besides these issues, this dress is strong condition - I would say even wearable! 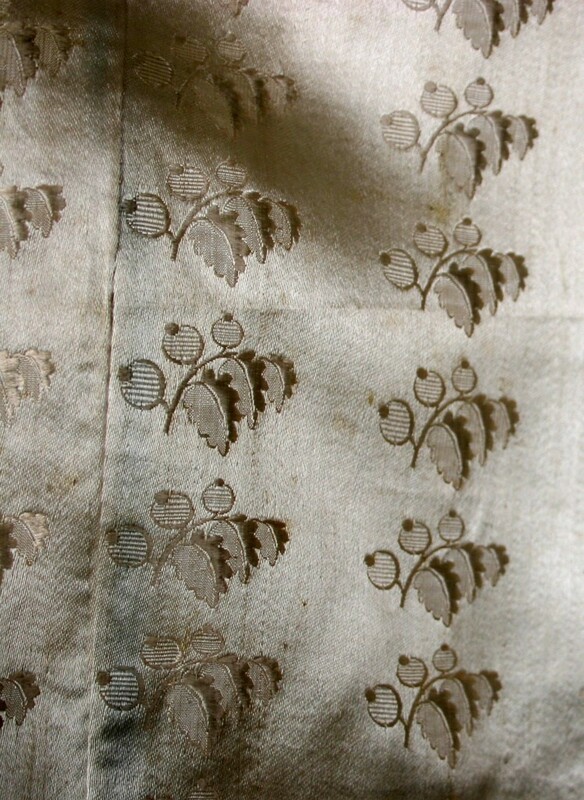 The material is in great shape and is not falling apart. 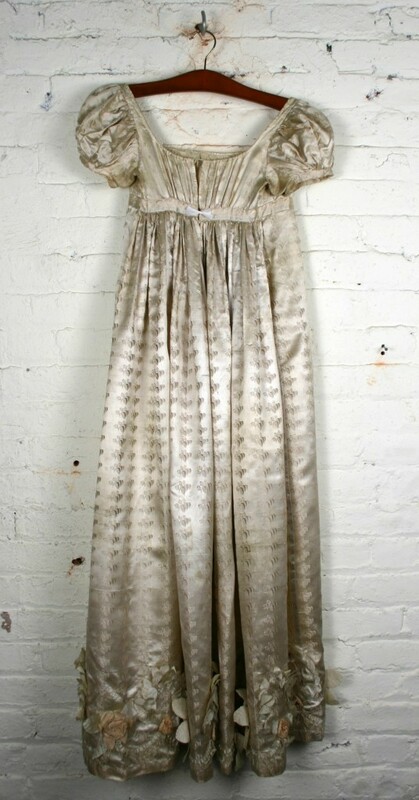 A rare and beautiful piece. So, there is some machine sewing on the cuffs on the sleeves but that's it. 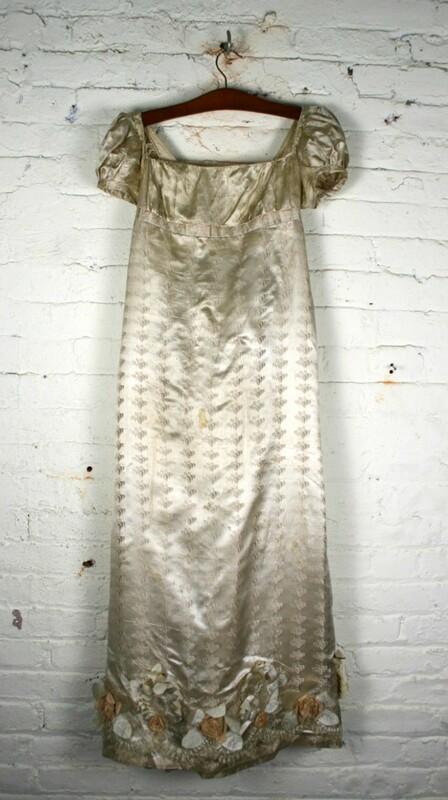 This is actually very common in older dresses that were worn much alter for Fancy Dress parties in the late Victorian/Edwardian period. 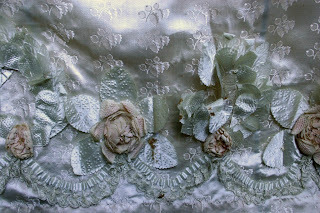 I have a 1780's bodice that was redone in the 1880's for that purpose. 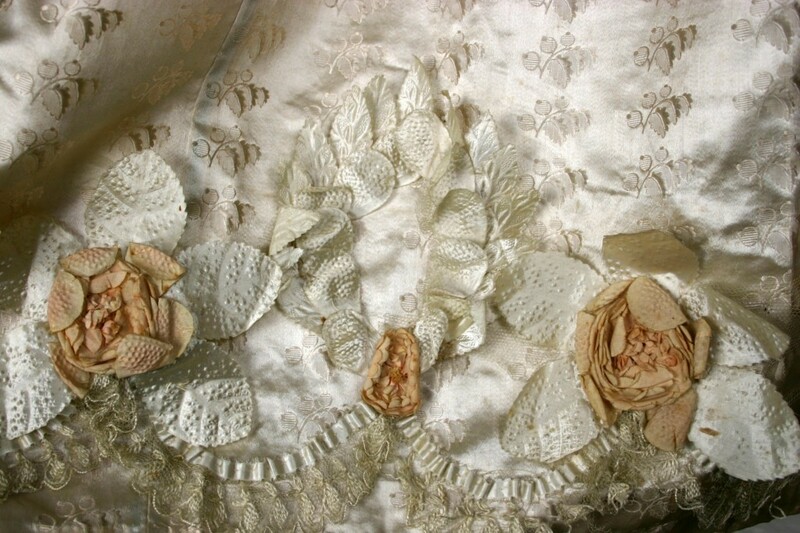 However, the rest of the decoration on this dress are all consistent with a ball gown from around 1815 or so.